As part of the project outputs the ACTUATE partners are developing training concepts and materials for safe eco-driving of clean vehicles. These training materials enable other public transport operators to train their own drivers of clean vehicles in a tried and tested manner. The trainings for trolleybuses in Salzburg and the pilot-trainings for hybrid buses in Leipzig received very positive feedback from the participating drivers and produced very promising results regarding the energy optimisation of these two clean vehicle types. As part of the ACTUATE training sessions a before/after training comparison (without passengers) was conducted: here energy consumption was reduced on average by 20% for trolleybuses and 5% for hybrid buses. 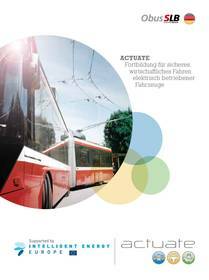 ACTUATE is now looking for interested public transport operators to test and validate the developed training concepts for safe eco-driving. For trolleybuses training materials are already available in Czech, German, Italian and Polish; training materials for hybrid buses are available in German. More language versions and training materials for trams and trolleybuses are currently being developed and will be available soon. If you’re interested to implement and validate the safe eco-driving concepts for your own clean vehicle drivers, please don’t hesitate to contact ACTUATE's project coordinator Mr Wolfgang Backhaus to get more information.